Okay, let me be clear about this one. Winding boucle from a cone onto a niddy noddy is almost as fascinating a past time as watching the cars rust. Really. If I’m to continue to do my own dyeing I will have to figure out how to fix my Clock Reel Winder. The skeins I’m winding are 560 yards, not sure why that magic number exactly – I tend to think it was the amount of yarn I needed for a shawlette I’ve made in the past – but that’s the number I’m sticking to for the moment. The final count of skeins from one cone is 10 with a smidgen of yarn left over so I can play to my heart’s content and not worry about wasting too much. It just makes it a bit easier to try doing something new for the first time. 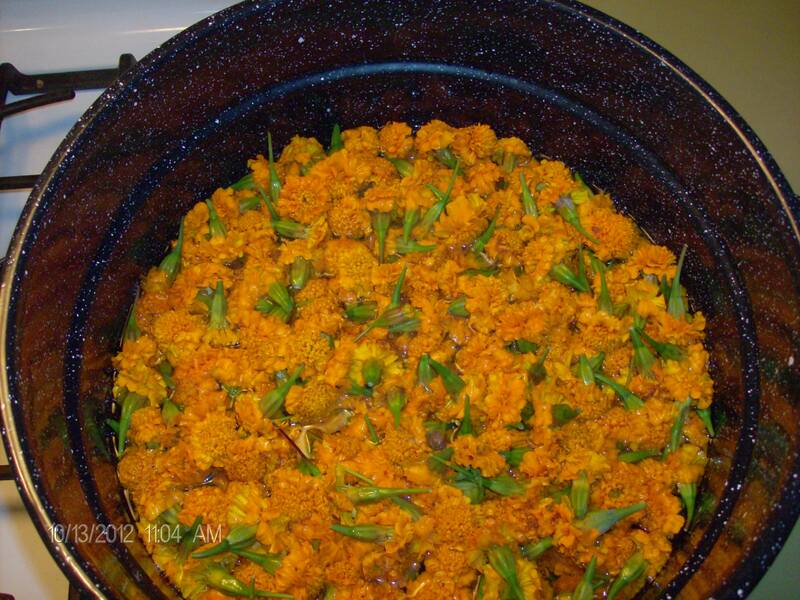 I know that is only 9, but I wound another while the Marigold blossoms were simmering on the stove top, which I might also add lends a truly unique aroma to the kitchen. 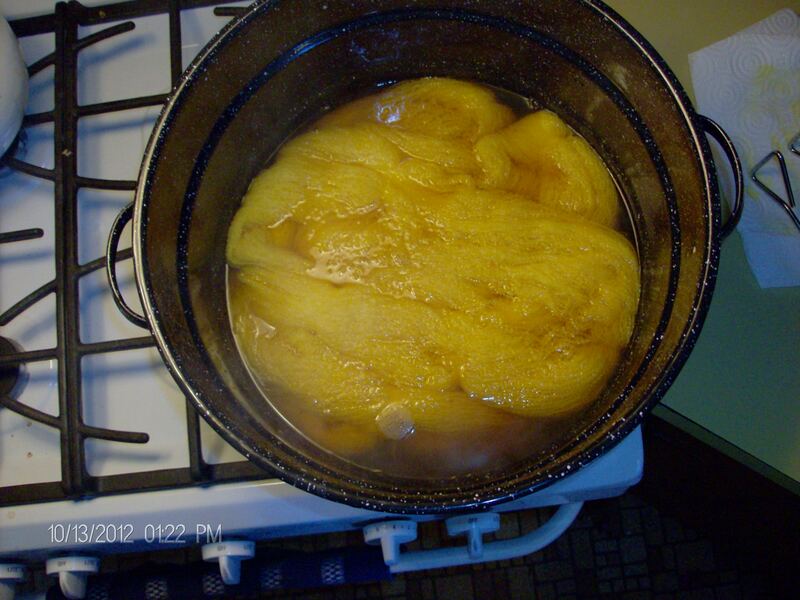 Luckily I had 2 pounds of the golden-yellow blossoms to use, it’s what the recipe called for, and the skein count turned out to be 5 to make a pound. This will allow me to try some over dyeing and experimenting later on so I was very pleased to discover that it worked out this way. 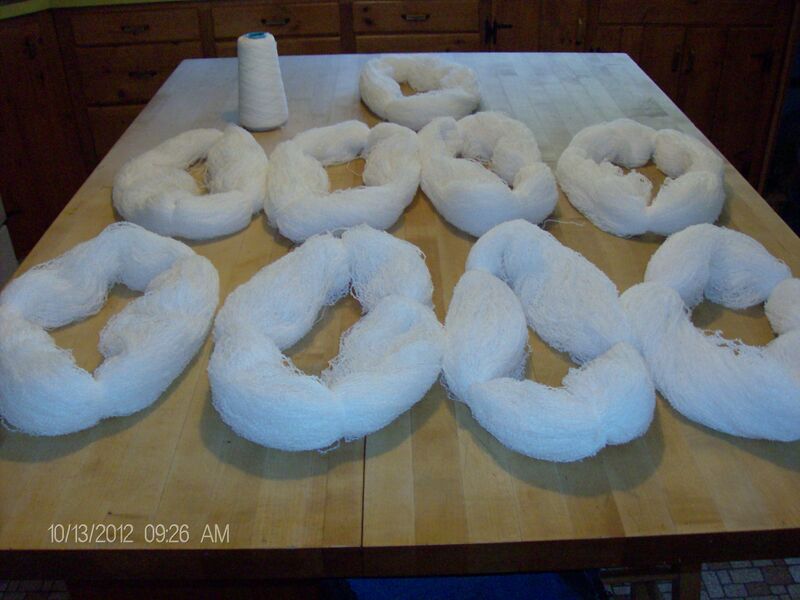 I’m just itching to get dye into a spray bottle and start spritzing some yarn, but that will be another day. I did simmer the yarn in an alum bath before I put it into the dye pot. I’m not entirely sure what the make up of the yarn is, I can’t decipher the label on the inside of the cone, but I decided that the first time out I shouldn’t get too innovative. Following the instructions the first time has usually worked out well for me in the past so I saw no reason not to trust it again. Here I have to admit that I’m not big on reading instructions first, I tend to fall back on them as a last resort, but I thought that this was a form of cooking and I always make a recipe the recommended way the first time…then change it to the way I want it from there on. So there it is! There was something a little magical about putting the yarn into the dye and watching it change color that I fear could become addicting. I have a starter acid dye set and packages of Kool-Aid still to experiment so who knows what will come of this…except possibly the purchase of more yarns, this time undyed! Eventually I hope to spin well enough to dye my own yarn as well, but I’ve too many things going on right now to spend the time I need to practice daily. It’s on my list though. Just imagine what the feeling of going through the entire process yourself can inspire. oh that’s what that is. It looks like peas and carrots. Now that you mention it, it does! LOL. I can still smell it. I think if I do this again I may just wait and do it outside over a fire. I am liking the color so far! Do you collect the blossoms while they’re still blooming or after they’ve fallen? I did clip them from the plants, but I can also dry or freeze them. If I’d read the instructions I could have been saving blossoms all summer. I’ll know better next year. Next up will probably be the red cabbage leaves, but they can stand a frost.